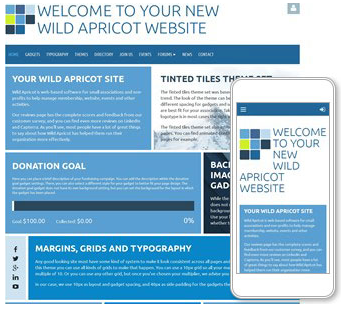 Wild Apricot has unveiled the latest in its line of mobile-friendly website theme sets: Tinted Tiles and Building Blocks. The Tinted Tiles theme set provides an excellent starting point for designers who want to quickly build a simple, yet modern looking site. The Building Blocks theme set is built off the same base as Tinted Tiles, but combines inverted typography and dark backgrounds with colorful titles and accents for a more elegant experience. If you choose to apply one of these themes to your membership website, we recommend first designing your pages around simple shapes and then customizing the appearance by applying different theme colors to section headings and gadget backgrounds. Each theme set includes four variations with different theme colors. They are also fully responsive on mobile devices, and include a condensed mobile panel that replaces the menu bar and login options on mobile devices. 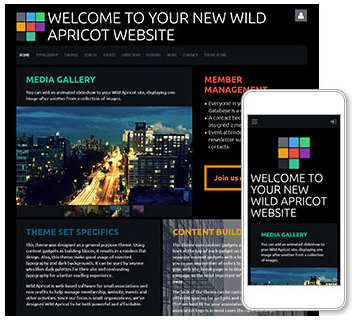 All of Wild Apricot’s theme sets are available from the Theme tab under the Website menu.